Posted byDr Scott Vatcher	 March 19, 2015 March 20, 2015 Leave a comment on Get the Benefits of Exercise in Just 10 Minutes or Less! Mood elevation is just one of the many benefits of exercise. Prevent up to 91% of obesity cases and Type 2 diabetes. Prevent 50% of all heart disease. Reduce risk of breast cancer by 60%. Reduce lung cancer, even in smokers, by 72%. BUT – is it possible however to get all the benefits of exercise in 10 minutes or less? Exercise has positive effects on blood pressure, insulin sensitivity, leptin sensitivity, mood, cancer, bone density and quality of life. Some of these positive effects can be explained by the increase in circulating hormones like human growth hormone post exercise. Human Growth Hormone (HGH) has received a lot of recent media attention lately as it is being prescribed as an anti aging drug. However this type of unnatural approach to rejuvenation may have undesired outcomes as it impairs the bodies natural ability to form these hormones. Fertil Steril. 2013 Jun;99(7):1814-20. 2013 May 10. Effect of rejuvenation hormones on spermatogenesis. This fountain of youth hormone depletes as we get older. Dropping off quite dramatically at age 30 and is said to be one of the major reasons why we age, hence why it is readily prescribed at anti aging clinics. The good news is that you can naturally produce more of this important hormone without the negative side effects associated with the synthetic forms of the hormone. 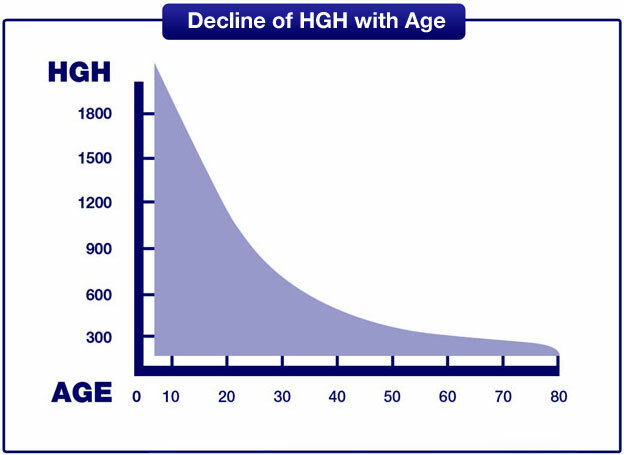 The sharp decline in HGH as we get older is most likely due to our current lifestyle factors more so than the normal aging process. The most effective way of boosting your body’s natural HGH production is with High Intensity Interval Training HIIT. “Protocols high in volume, moderate to high in intensity, using short rest intervals and stressing a large muscle mass, tend to produce the greatest acute hormonal elevations.” Sports Med. 2005;35(4):339-61. Hormonal responses and adaptations to resistance exercise and training. Dr. Phill Campbell world fitness expert and author of “Ready, Set, gGo” found a 77% increase in HGH following a HIIT training protocol in a study with male workers. HIIT has been shown to be a far more superior form of exercise than traditional low-moderate intensity sustained exercises like jogging for boosting post exercise hormonal changes. Growth Horm IGF Res. 2010 Oct;20(5):380-5. Effect of high- and low-intensity exercise and metabolic acidosis on levels of GH, IGF-I, IGFBP-3 and cortisol. HIIT is an exercise program that incorporates short bursts of fairly high intensity 80% of maximal exertion followed by short rest periods 10-90 seconds of rest between sets. It appears a minimum of 4 sets gives the greatest hormonal response. Med Sci Sports Exerc. 2003 Apr;35(4):644-54. Hormonal responses after various resistance exercise protocols. Rest periods of greater than 2 minutes may reduce the hormonal response. However longer rest intervals have been shown to benefit maximal strength (topic for a future article). 30-60 second rest periods might provide the greatest benefit for hormone production. J Strength Cond Res. 2009 Jan;23(1):62-71. The effect of resistive exercise rest interval on hormonal response, strength, and hypertrophy with training. One study showed that a greater hormonal response was after running 400 m – 300 m – 200 m and finishing with 100 m compared to going the other way. i.e starting with 100 m and increasing volume. J Strength Cond Res. 2011 Aug;25(8):2161-9. Hormonal and inflammatory responses to different types of sprint interval training. The Tabata method is probably the most famous prescription of this type of training …. This method can be used with any type of exercise you like. A challenging but quick way is to complete as man squats as you can in 20 seconds with 10 seconds rest in between then repeat 8 times. It can be done with or without equipment and takes only 4 minutes. This type of training improves both anaerobic and aerobic fitness. As with all research there are conflicting views and results on the amount of sets, volume and rest times. However, shorter rest periods and a minimum of 4 sets appear to provide the greatest HGH production. I recommend constantly mixing up your program so as the body does not adapt to it. Some days rest for 10 seconds sometimes 2 minutes. Do anything from 3 sets to 10 sets on a given day. Mix it up as much as possible. If you’re a runner the simplest way to start to incorporate some interval training into your exercise routine is by adding short bursts of sprints into your normal run/jog. E.g sprint as fast as you can for 100 metres then go back into your jog. You may wish to finish the last kilometer of your run this way to achieve the hormonal benefits. If your currently only walking simply go into a more brisk pace for 100 metres then back to your regular speed and repeat a few times through. If you are currently doing Hot Yoga (Bikram series) you will notice the entire floor series is a type of HIIT with maximal effort followed by rest periods (Savasana). I suggest doing HIIT 2-4 times per week depending on goals along with other types of exercise to get the most benefit. Be sure to get a good quality protein source like that from grass fed Whey within 30 minutes of your HIIT session and optimise your vitamin D levels to get the best HGH release. Try different variations and most importantly – have fun with it!